A stoppage time goal saw Wanderers lose in their first ever meeting with Accrington Stanley at The Crown Ground. 19 year old Stanley sub Andy Mangan grabbed the winner for the home side just as it looked as though Will Antwi’s second half equaliser had earned the Blues a deserved point. The game was tinted with controversey after Wanderers looked to have denied a clear first half penalty when Kevin Betsy was blocked by Leam Richardson, as the Wycombe player burst into the box to try and meet Scott Golbourne’s low cross. Wycombe Assistant boss Steve Brown was so incensed by the decision that he was sent to the stands for comments he made to the fourth official. That incident followed Stanley's opener on 27 minutes where Ian Craney thundered in a free-kick which buried itself in the stanchion to put the home side ahead. The free-kick had been given for am adjudged foul by Tommy Doherty on Gary Roberts. Doherty didn't agree and despite being substituted in the 57th minute was still reminding the referee of the decision as the teams left the field at the end of the game. 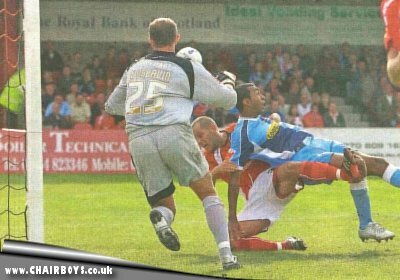 Stanley's goal came against the run of play but Wanderers could have been level four minutes later but Betsy (playing as an emergency striker in place of the injured Jermaine Easter) tried to chest down a Golbourne, rather than shoot first time, allowing Stanley 'keeper Ian Dunbavin to block. At the other end Russell Martin denied Roberts a second goal for Accrington with well timed block. Wanderers equaliser was not without debate too. Peter Cavanagh upended Betsy on the touchline and the fourth official awarded Wycombe a free kick even though Cavanagh insisted he got the ball first. Cavanagh saw yellow while Stanley boss John Coleman gave the officials some ear. Stanley were not amused when Chris Palmer's resulting free-kick was flapped by Dunbavin for Tommy Mooney to head back into the six-yard box for Anti to nod home. From then on Wanderers could have taken all three points - Betsy, Mooney and Anya all being offered up chances but either missing the target or seeing Dunbavin recover. It looked like a share of the spoils until the Wycombe defence was caught out when Mangan raced through before firing past Ricardo Batista. Speaking after the game, Wycombe Assistant Manager Steve Brown said: "It feels like a cruel game. We pinned them back for long spells and created chance after chance and to get hit with the sucker punch in the 92nd minute is devastating." The defeat at Accrington came a week after Wanderers had snatched, Brown added: "We now know how Swindon felt. It was a real sickener. We were worthy of getting something out of the game but we’ve got absolutely nothing."